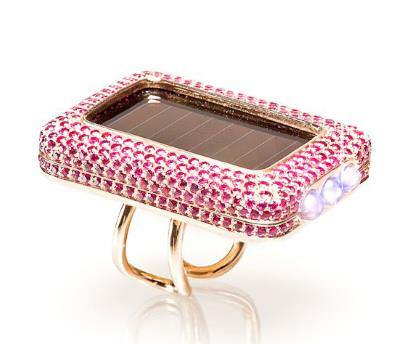 Artistar Jewels is the unmissable date for all the contemporary jewel lovers. Beginning on February the 23rd up until February the 26th 2017, 142 international designers from over 30 different countries will take part in the fourth edition of the project with 400 creations, mostly never seen before. For the first time the event will take place in the prestigious Giureconsulti Palace in Milan during the February Fashion Week with the potronage of Comune di Milano. This edition, that has seen an increase in participations with 40% more artists present against the previous edition of 2016, can count well-renowned names and will host the amazing creations of Gillo Dorfles for San Lorenzo, GianCarlo Montebello and Philip Sajet. 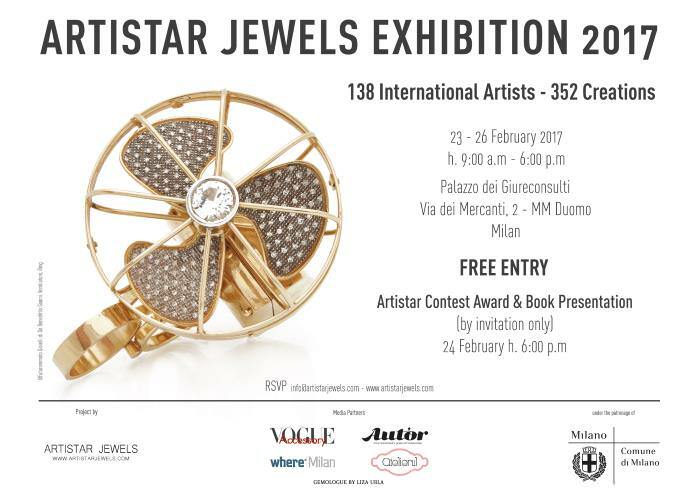 Artistar Jewels is the event founded in 2012 by the designer Enzo Carbone and is now a benchmark in the contemporary jewelry scenario. An international showcase for well-known artists and springboard for emerging creative talents. The participants present their works, unique pieces or small series, selected for the high artistic value, for the technical sperimentation and the stylistic research. Evocative body ornaments, very different for the materials and the techniques but linked by the fil rouge of the narration of a story, always present in each creation. 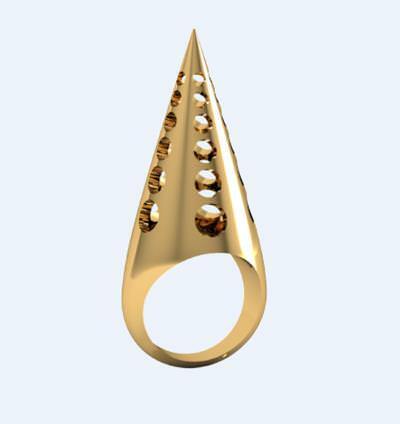 Artistar Jewels is a project born with the aim of spreading the culture of contemporary jewelry and designed to anticipate the market trends, one of the first italian realities which has exploited all the potentiality of the web to implement the commercialization of contemporary jewelry. It’s the only contest in Italy, and one of the few in the world, that offers a never given before and across-the-board reading on the latest evolution of contemporay jewels and offer all the selected participants the extraordinary possiblity of taking part in a prestigious show, collaborating with experts in the sectors, taking part in a contest, selling the creations through the online shop platform www.artistarjewels.com and seeing the works in a publication distributed on the international scale. Even for this edition the participants will see published in the volume Artistar Jewels 2017 the photos of the shooting organized by Artistar that for this edition will be curated the photographer Federico Barbieri. The book, edited by the publishing house Logo Fausto Lupetti, will be available on a nationally and internationally level: sold in all the bookstores in Italy and in all the major European capitals, and shipped to over 5,000 operators of the sector. The introductive texts will be written by Eugenia Gadaleta, expert of contemporary jewelry, who, apart from being the Marketing & Communication Manager of Artistar, will curate the special contents of the volume Artistar Jewels 2017 together with Selene Oliva – fashion and jewels freelance journalist. The jury is made of new personalities: Elisabetta Barracchia – Editor of Vogue Accessory and Creative Director of the Fashion Department of Vanity Fair – Mariastella Campi – fashion journalist – Bianca Cappello – historian and critic of jewelry – Gianni De Liguoro – founder and stylis of the De Liguoro brand and also protagonist of a special exhibition in a special area – Guido Solari – founder and owner of the Scuola orafa Ambrosiana of Milan via Savona, 20 – Liza Urla – one of the top jewelry blogger and founder of GEMOLOGUE. The three winners will have the chance to participate for free in Artistar Jewels 2018 and will be included as special contents in the 2018 book. Other significant news is the chance for one of the participant to collaborate with the bijoux brand De Liguoro. Selected by the founder and juror Giovanni De Liguoro who in the eighties collaborated with the top brands of the fashion Made in Italy, from Trussardi to Alberta Ferretti, the artists will help in the personalization of a maison’s jewels which will then be produced. A idea born to create new synergies and that is the perfect summary between tradition and innovation. To an under 27 designer, Scuola Orafa Ambrosiana of Milan will offer the free participation to the Professional Goldsmithing course to learn all the most important laboratory techniques, with the realization of several goldsmithing jewels designed by the School. Finally, for the very first tim, a selection of the artworks will be hosted by eminent galleries: Spazio Espositivo Adiacenze of Amerigo Mariotti and Daniela Tozzi in Bologna, Creativity Oggetti of Susanna Maffini in Turin and the Concept Store Tiberius in Vienna.